The chateau de Filières stands on the site of a medieval fortress surrounded by moats. The lines of the ancient house were discovered during the last drought and still remain in the middle of the courtyard. 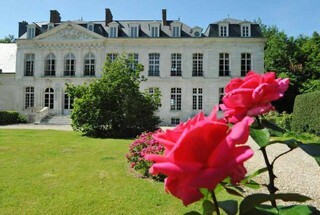 Under Henry the Fourth, the Chardon de Filières family built there a stone manor house. In 1785 Charles Alexandre de Catteville replace the stone building by another, more important one. The construction was stopped by the Revolution. That is the reason why today two different styles can be admired : one still from the Renaissance period, the other one from Louis XVI period. The dovecote, made of chalk and flint belongs to the 16th century manor house. Stables and monumental outbuildings called "le Dôme" date from the 19th century. The whole property stands in the middle of a wide "clos masure", typical from the Pays de Caux region, surrounded by planted embankments and completed by a superb alley called "the Cathedral". The garden, flourished by beautiful rhododendrons has to be seen too. The exceptional furniture offers a magnificent example of the decoration of the 18th century.